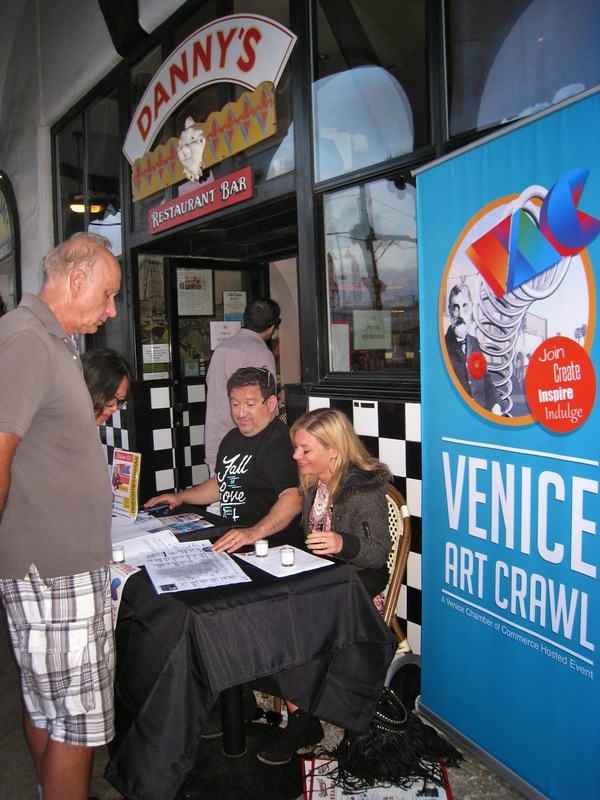 Thursday was the June edition of the Venice Art Crawl, and it was as much fun as ever. It was also - as ever - nearly impossible to see it all, though I did keep on trucking enough to get a good bit in before just giving in to the party of it all. 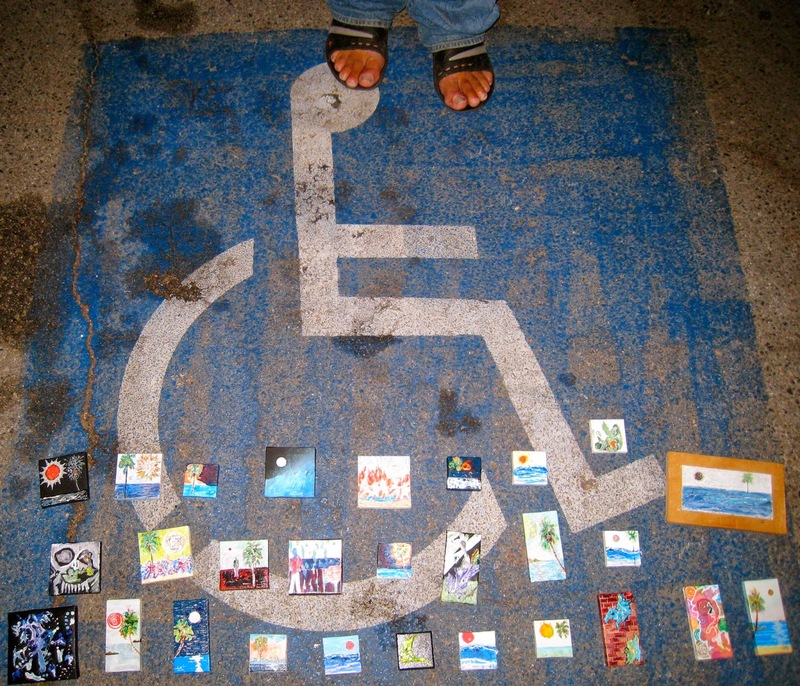 I hit the Art Walls first, as there was a group called the "Setting The Pace Foundation" painting on the walls for the Art Crawl. It was cool, and the sunset is always a wonderful backdrop. I always have to swing by the skatepark to see what's going down, so I did. 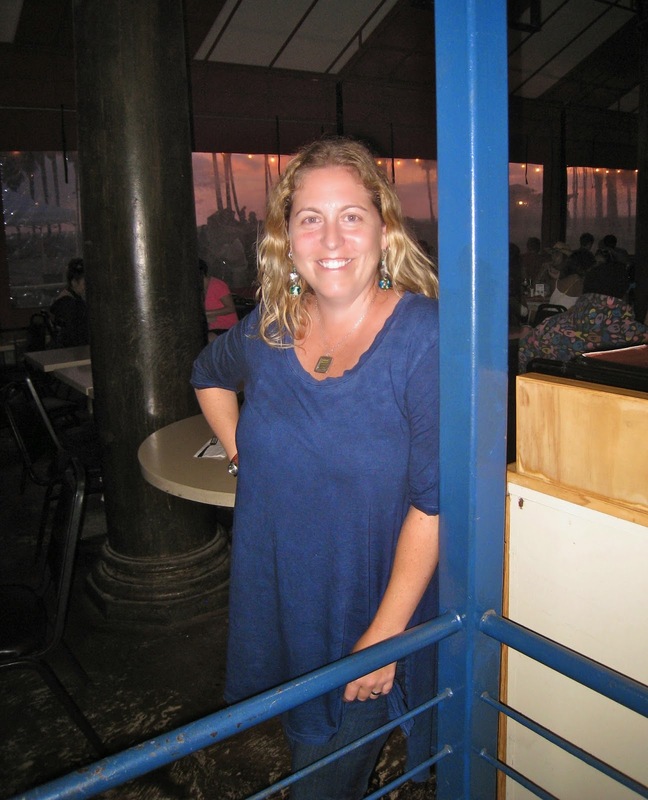 ... and say hi to the artist, enjoying friends and family at The Sidewalk Cafe. The sunset was now threatening to outshine all the art, so it's good that it all carried on after dark. 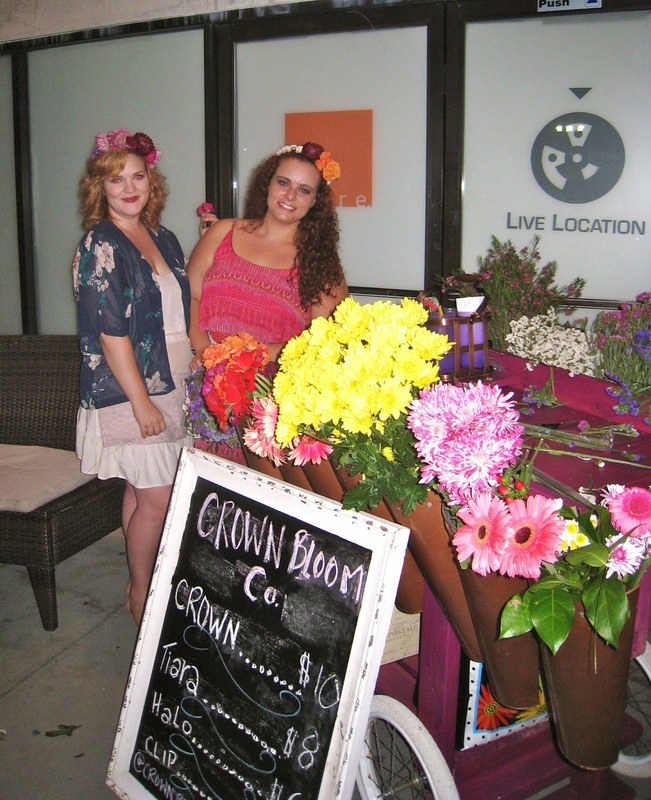 I headed over to "Emerged at Alpha," a space on Market Street that had girls selling flower crowns, live music and a whole bunch of art. It was cool, but I didn't recognize anybody. It was fun to see a great mix of people, once again coming together all because of art. 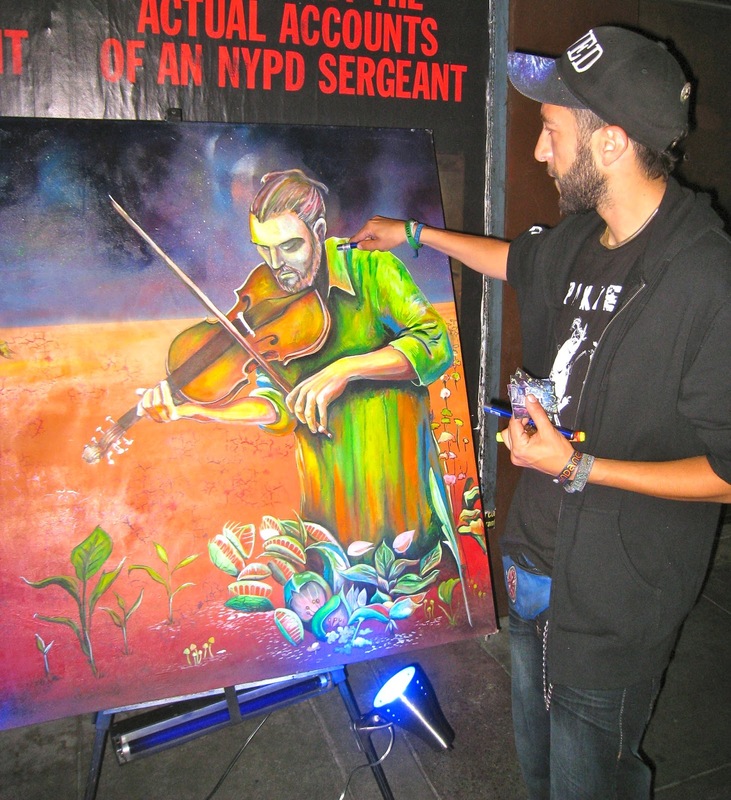 I knew there was a Venice Symphony Orchestra fundraiser going on over at Horizon, with a group show curated by Jules Muck behind the house with her mural on it. What I did not know was that the Orchestra wasn't really playing (only a 3 piece could make it this night), but there were naked ladies getting body painted in there, so that seemed to satisfy all who strolled through looking for some classical music. It looked kind of fun. I may volunteer next time (for being painted on, not handing out maps). I always enjoy chatting with the artists that set up in the parking lot next to Hama Sushi, but I always feel bad for them because it is almost pitch dark in there, nearly impossible to see the work. We need to get some lighting in there for them next time. Arist Niciforos had little tiny painting that had 3D waves coming off the beach scenes ... I got one for $5, and was happy to see that it can be a magnet on the fridge art piece. Set up next to him was a very smart guy whose name I lost, but whose art reminded me of Gaudi. In fact, he told me all about the church in Spain designed by Gaudi that has taken 100 years to build and it still isn't. The conversation was enlightening, even though I could barely see them. Set up outside the parking lot, getting some street light on the subject, was a guy who said his name was Ant, who had some "controversial" pieces. I just found them to be true. Another good conversation was had, and then I was late to meet friends at The Townhouse. After some catching up and refreshments, we had more ground to cover. I wanted to see the "Skate The Sky" pieces at Venice Originals, but the place was all locked up tight, so I stopped by the packed Lightning Bolt shop, where people were crammed in listening to Kathleen Myers, but too full to really see the art. Next it was Gotta Have It, who featured work by Theresa Flowers and music by the ever-ready Paul Chesne. 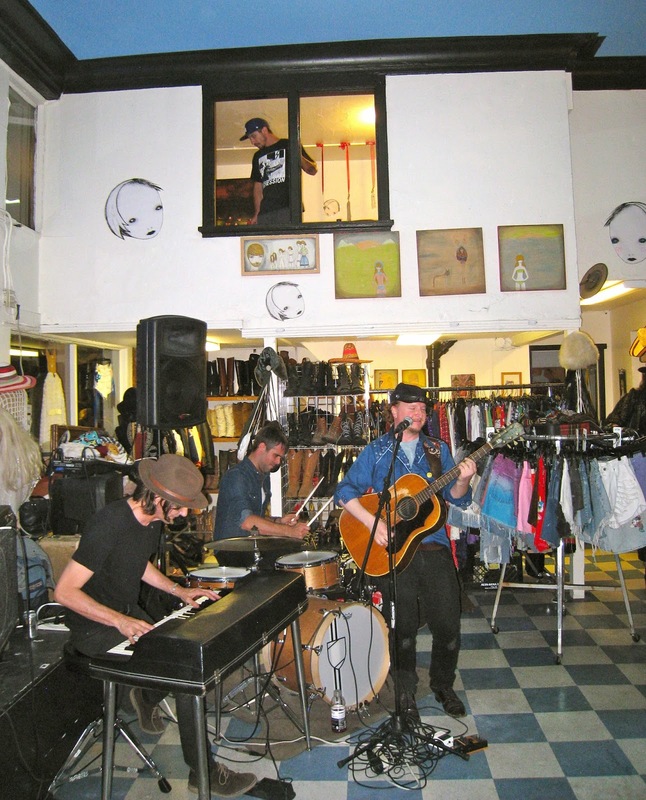 We watched Chesne's set from up in the new little nook gallery overlooking the shop, which was great. It became kind of our own headquarters that we could shout out the window from to people on the sidewalk to come up and join us. But this guy (whose card I also lost) was on a new level, with a laser pen thing that colored in the images as a black light showed it appear. It was trippy, and I'm always a sucker for live painting. There was SO much to see and do, that it was funny when I met a reader of mine (Hi! ), who asked if I would see more this time than I did last, since I'd mentioned in that article the difficulty of getting around to it all when you keep bumping into friends to catch up with and stuff. The answer was that I believe I saw even less this time, but had even more fun! After a quick bite at Hal's (where they launched their new gallery), we went all the way over to West Adams, but still kind of Venice, as we visited the Mid City Yacht Club, owned and operated by Commodore Noah Farrell (of Abbot's Habit). Venice is a feeling ... of people being free and expressing themselves through their art, whichever medium it takes shape with. And you can take it with you. Another whole night of art and expression, wound up with all Venice people all the way across the city, but that feeling carried with us the whole way. And next time ... I promise to see way more. With the help of the ample maps that I'm sure will be available to all. Thanks again, VAC!